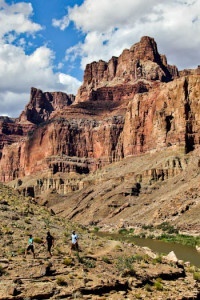 Grand Canyon Whitewater Rafting Is Soooooooo Much Better Than The 12 Minute View From The Top! The Grand Canyon scenery was truly awesome: every moment in every direction while whitewater rafting was an amazing view. This is the REAL meaning of awesome! Sleeping under the nightime sky was a first for me, I wished I could sleep with my eyes open! Couldn't, so I woke up a few times a night and was greeted with a new but equally amazing sky. I was expecting whitewater rapids but the quantity and quality was almost overwhelming. The Colorado River was clear and the weather was hot. Every time I started to heat up, there was another rapid or ripple to splash that cold clear water on us. The hikes were more strenuous than I expected but I managed most and I'm glad I had a year to lose a bit of weight and strengthen my legs. The food was exceptional & my special diet was accomodated. However there was way too much food at every meal and I felt bad that so much had to be thrown away. Evan was our leader with Wren on his boat. Our driver was Ben and Sam was the other guide. I felt very confident and safe in their skills and judgement from the getgo. They were all helpful, knowledegable and a lot of fun! We got a 'bedtime story' about river lore every night and they made my 60th birthday special with a brownie cake and candles. Evan took us to all the side hikes and falls arranging each day's activities and time schedule to make it all possible. 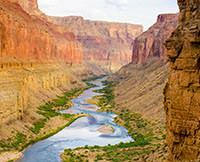 If you go Grand Canyon whitewater rafting, get over peeing in the river (or off the boat, yes, girls, you can do it!) ASAP so you keep drinking. Keep your shoes in a bag while you sleep to discourage nightime visitors, someone got a scorpion bite on his ankle. Get on and off the raft carefully even if that makes you look dorkey. Make friends quickly, this does become your family for the trip....ours were great fun!